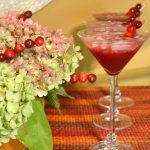 Cranberry Ginger Punch Beverage Recipe made with ginger root simple syrup,unsweetened cranberry juice, orange juice and ginger ale. For a fun garnish, three fresh cranberries are skewered together on a small stir stick. In small saucepan, place sugar, water and chopped ginger root over high heat to boiling for one minute or until sugar is dissolved. Remove from heat and cool for 20 minutes. Remove ginger pieces from mixture. Pour Ginger Syrup into a glass pitcher. Add cranberry and orange juice with the ginger syrup. Pour beverage over crushed ice in individual cocktail glasses, add ginger ale. Dress up the beverage with a cranberry skewer. To make cranberry skewer, string fresh cranberries in single layer on a wooden skewer, serve immediately with beverage. Fresh cranberry skewers are added to the hydrangea, apple and cranberry floral centerpiece.